Use the Fund Management page to manage different internal and external giving options (comparable to Shelby v.5 Purposes). In order to accept Online Giving you need an active payment gateway processor and at least one Arena fund with online giving enabled. From the Contributions menu, click the Fund Management option. If this is the first access to this page, a prompt displays asking you to choose a Shelby v.5 Company. Select your organization name from the drop-down list and click the Apply button to add active Shelby v.5 funds to Arena. Note that Arena can only connect with one Shelby v.5 Company. 1. Click the Add New Fund icon at the lower right-hand corner of the page to add a new fund. 2. Complete all fields for this fund. To edit details of an existing fund connected to a Shelby v.5 Purpose, select the Edit icon next to the fund. Active funds with an Online Name and with current start and end dates are available for online giving. •Active status – Select if the fund is active. Active funds are available for Contribution Entry and online giving. •Name – Enter the Name of the Fund. •Description – Enter a description for the fund. •Online Name – Enter the name to display online. Active Funds with an online name, valid start and end dates are available for online giving. •Tax Deductible – Select if the fund is tax deductible. •Allow Pledges – Select if you are going to allow pledges. •Start/End Dates – Enter the start and end dates for this fund. Start and end dates determine the period the fund is available for online giving. •Category – Select a category to associate this fund. Fund Categories are customizable. See your Arena Administrator. •Default Project – You can optionally select a default Project Code for this fund. •Company – Enter the Arena company number for this fund, such as 001 from Shelby v.5. •Fund # - Enter the fund number. •Bank Account # - Enter the bank account to use for this fund. •Revenue Department # - Enter the revenue department number for this fund. •Revenue Account # - Enter the revenue account number for this fund. •Project Code - Enter the project code for this fund, if applicable. 3. Click the Update button to save your fund. 4. 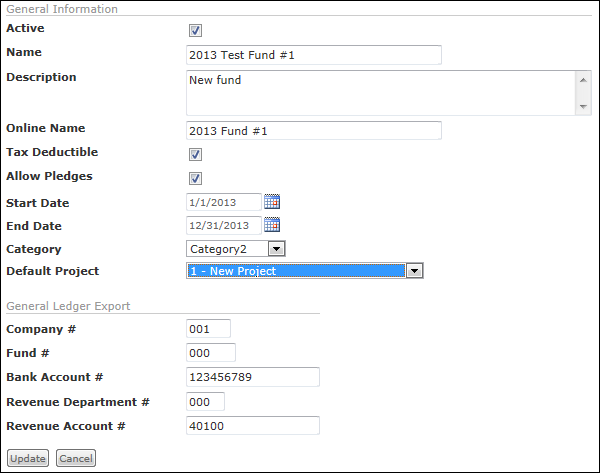 From the Fund Management page, you can edit existing funds, change the display order and use the filter options. •ID – This is the identification number Arena assigns funds. If your organization uses Arena’s online giving, you can use the funds to specify which funds to make available on a specific page. •Fund – This is the name of the fund. •Description – This is the description of the fund. •Online Name – This is the name to use for online giving purposes. •Category – This is the fund category associated with the fun. •Active – A checkmark icon in this column indicates the fund is active. •Tax Deductible – A checkmark icon in this column indicates the fund is tax-deductible. Please consult your tax advisor for IRS reporting guidelines for charitable contributions and tax deductibility. 5. Click and hold the Reorder icon to change the order the funds display on the Fund Management page. The Contributions Application and Contribution Entry pages reflects the same fund order. 6. Click the Edit icon to edit a fund. You cannot edit some Arena Funds fields linked to Shelby v.5 Purposes. 7. Click the Delete icon to delete a Fund. You can delete funds with no associated Contributions. 8. Click the Add New Fund icon to add another fund. When connected to Shelby v.5, a checklist of active purposes display, listing all purposes not already in use in Arena. Use the check boxes to choose which purpose to tie to this fund, and click the Update button. Note that while it is possible to have Shelby v.5 Purposes connected to Arena, we strongly recommend against this practice due to the synchronization issues this situation creates. You can delete a fund that does not have contributions. In order to delete a fund with contributions, you need to delete or reassign contributions. Associated Pledges are also deleted.